When I was a kid George and I were friends before he passed away. He was quite a pitcher in his short time with the Red Sox. Anyone interested in his accomplishments just e-mail me. Jboosted92: Very nice display. I am guessing that is a nice framed photo of Ted right above the display. And David, thanks for the best laugh I had all weekend ! Saw this and thought of this thread. I just picked this up on ebay, just cause it looked cool. Its like 6x9, and the guy knows nothing bout it. I think its newspaper art. Im trying to determine the significance of the date of the artwork. That's a terrific looking display you've got there, Well done! Great looking display -- what are the two bats in the case? Nice Mike, I've never seen that before and Xmas is just around the corner. I'm a fourth generation Yankees fan and thus genetically predisposed to despise all things Red Sox, but even I had to admit that this was pretty sweet. It's a photographic composite by Carl Horner (his photographs were the basis for a lot of the early 20th century tobacco cards, including the famous Honus Wagner) featuring the team that won the first World Series in 1903. 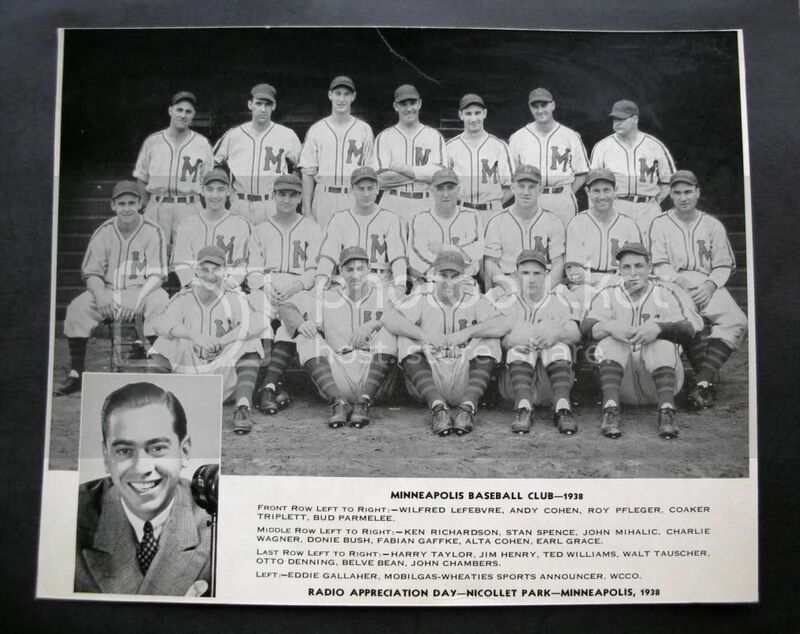 There was some writing (player identifications) on the photo which made it a bit more affordable than it might otherwise have been, but it still sold for over $11,000. Well Jonathan, You just gave your collection the touch of class it was lacking all these years. Terrific item. Oh, no, I don't own it! I'm the lead cataloger for Heritage Auctions, and it's a piece that impressed me when it crossed my desk. I don't think my father would ever speak to me again if he came to visit and saw that hanging on my wall! but it belongs here too. The final game of the 1912 World Series, enjoyed by a crowd on Main Street in Colorado. 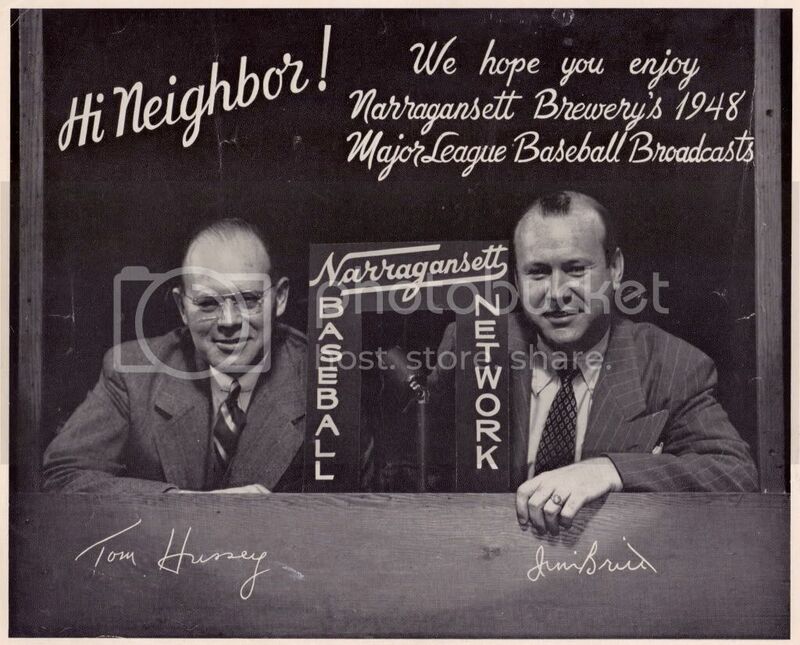 No television, no radio - - - the score is updated on a box-score chalkboard. Unfortunately - the Red Sox win this one, and with that win the 1912 World Series. Last edited by bijoem; 10-26-2009 at 08:01 PM. Last edited by Ladder7; 12-08-2011 at 04:48 AM. 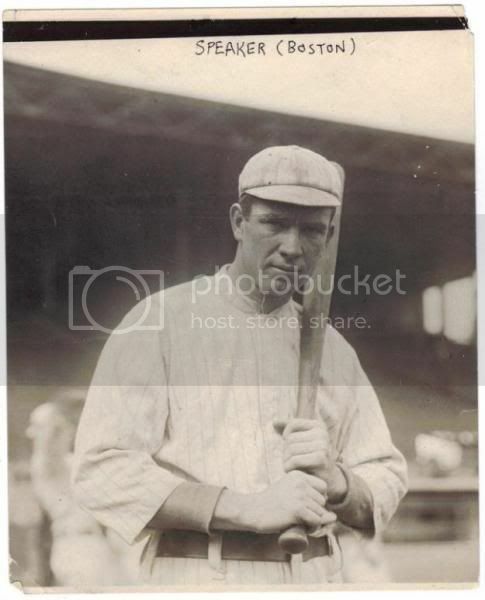 Joe Wood warming in Fenway on September 6, 1912, before his famous duel against Walter Johnson. Updated photo of 1912 world series wall! Poor photo. Looks alot nicer out of the old frame and in person. Not for sale and I no longer own it. 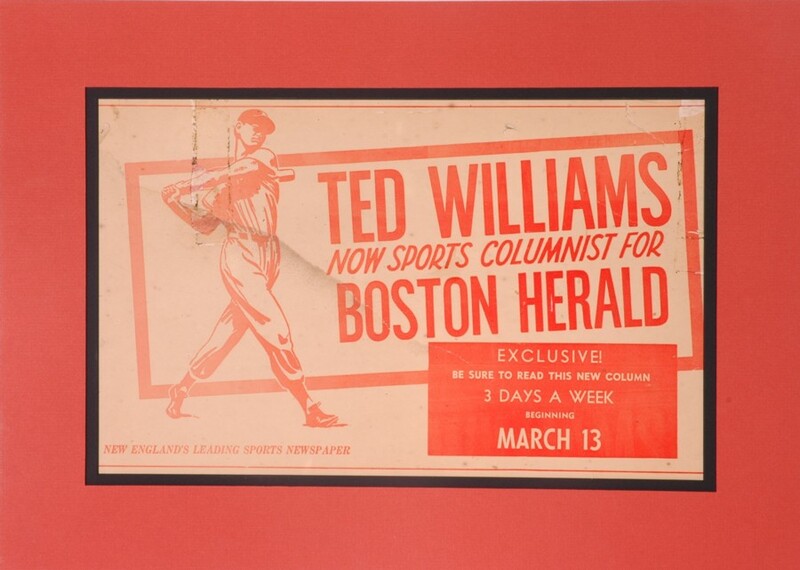 Extremely Rare 1954 Wilson Franks Book "Batting and Fielding Secrets"
Ted Williams' last game/hr ticket stub and program. More please!.. It's a long winter. Scraping the bottom of the peanut butter jar over here. Trimmed, taped and framed beater. Last edited by Ladder7; 12-17-2010 at 04:26 PM. Last edited by Forever Young; 03-01-2010 at 01:47 PM. Absolutely KILLER image of Speaker! Really like this Type I photo (Conlon) of Everett Scott. Just picked this pen and Ink up..Kinda nice IMO. Incredible stuff from everyone! Here are some odd ball Red Sox items I have been meaning to post. There is a lamp, a ceramic glove, a Frazee Theater pamphlet (ca 1924), two World's Champions bats (which I have been told were made to comemmorate the 1912 World Seris but I do not know if that is definitely true), and a Boy Scout merit badge pamphlet showing a Sox player (this piece combines my baseball and boy scout memorabilia collecting passions). Nice stuff Alan and I also like that lamp. I wonder who that player is in the Boy Scout photo? I would say early 70's with the uniform and sideburn. Also Nice Speaker photo and nice display Rawn. Here's one for you. Type I Thompson photo. Very nice Mike. The display belongs to Harold's grandson and I will pass along the message to him. 1910 Huntington Avenue Grounds. Michael, stellar shot of the Rough. Thanks guys! I love the lamp as well although I have no idea if it was homemade (I think so) or when it was made. The Merit Badge pamphlet is from 1973, and it does not mention who the player is. Below are two more oddball items to keep this thread alive a little longer. The first is a Red Sox doll (circa 1960s?) and the second is a spring training hat of similar vintage. Please post more if you have it. The items posted thus far are incredible! Hello Alan, Nice lamp. I believe (I could be wrong) that it is a circa 1950s Stanford Pottery lamp. If you search baseball lamp, some others have been shown on the memoribilia board. 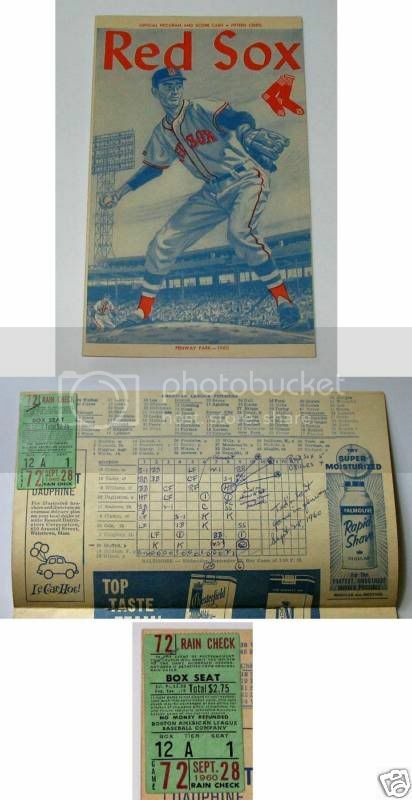 George "Rube" Foster scored no-hitter program and ticket- the 1st at Fenway Park! I thought that all of you Red Sox fans may enjoy this post. Here are photos of a (partially) scored program and ticket from the very first no-hitter ever thrown at the original historic Fenway Park. On June 21, 1916 the Red Sox' own George "Rube" Foster no-hit their arch-rival the NY Yankees 2-0 in front of crowd of 4,528 faithful fans. The ticket and scored program resided in a fan's scrapbook for over 80 years before in was liberated and made it into my waiting hands last year. Just for grins, I'm also including a picture postcard of Foster to show you what he looked like in his heyday. Enjoy! Keith is correct. Stanford Pottery did these lamps for at least 6-7 teams, that I have seen. Athletics, Pirates, Phillies, Reds, Indians and Braves are among those that I've seen. Nice Piece... are you going to seek out a vintage shade for it? You will find tons of options on Ebay. If so, please post... would love to see the end result. Last edited by perezfan; 03-06-2010 at 07:43 PM. Thanks Mark and Keith! I had no idea it was a Stanford Pottery lamp! I paid less than 5.00 for it at an antique shop in New Bedford MA a few months ago. I figured it was homemade. I am not sure what I will do with it now. Are the shades for these lamps specific to the teams (do they even show baseball graphics at all?)? I've seen lots of different shades with these. A replacement shade is not a big deal (oe even a detractor). I would go with a plain beige or off-white shade, and let the base speak for itself. I am not sure whether these lamps originally came with a team graphic or logo on the shade, but I doubt it. Perhaps someone else here might know? I am proud to add my just authenticated 1975 Carlton Fisk home white post season game used jersey to the mix. It appears that this is quite possibly the same jersey that Carlton Fisk was wearing when he hit the famous homerun in game #6 of the 1975 World Series. Last edited by LOUCARDFAN; 03-23-2010 at 09:32 AM.